Today ASUS officially announced the launch of the Eee Pad Transformer tablet in North America, and it comes at the surprising low price of $399 for the 16GB model and $499 for the 32GB version. Compare that to $599 for the 32GB Motorola Xoom and suddenly the Asus Transformer is looking pretty darn good, especially considering the specs are almost identical to the Xoom, except the Transformer has a higher-quality screen. Additionally, the Eee Pad is called the Transformer because it comes with an optional docking station with a full QWERTY keyboard, touchpad, ports, and the docking station even boosts battery life because it has a battery built in. 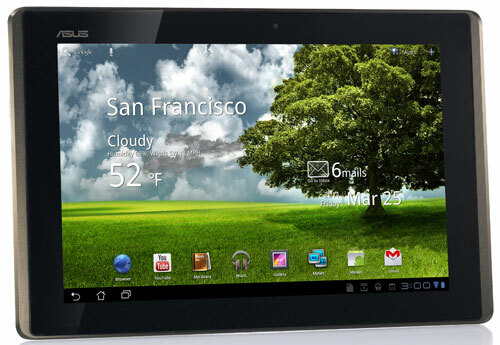 The Asus Eee Pad Transformer goes on sale April 26th, and will sell from several major retailers in the US and Canada, including Amazon, Best Buy, Staples, Office Depot, Target, and Walmart, to name a few. I’ll definitely be picking one up to review, so check back next week. In the mean time, you can find some more information about the Transformer—a list of specs and a video demo—over on the new Asus Transformer review page, of which will be updated with the hands-on review and video once it gets finished. Higher screen quality I assume due to the “ISP” technology? So it provides for better viewing angles I have heard. I am still holding out to see the upgraded Arnova 10 supposedly in may. I am primarily interested in a 10″ for reading pdf files, so if I can get it for around $250 I might as well wait. I lifted yesterday both an old IPAD at 1.5 lbs and new one at 1.33 lbs. To me it makes a big difference. The Transformer’s screen should be a lot like the iPad’s, with a little better pixel density. IPS display is a big plus. Already out of stock. Did you get one? No I did not, which probably isn’t such a bad thing looking at my ridiculously full schedule :). I still haven’t even started the iPad 2 review yet :(. But I definitely will be picking one up as soon as I can find one. At $399 I think these are going to be pretty popular.